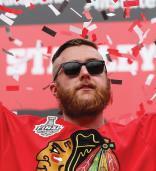 Home for Scott Darling was wherever he lugged his three duffel bags and the 47-inch television he had purchased on clearance at Best Buy. Darling had simplified his life to those possessions out of necessity. Owning anything more would have been excessive as he had no idea where his goaltending career would take him from one day to the next. That way he could pack and depart quickly. Darling’s professional stops included eight teams in four different leagues between 2010-14. He played everywhere from the Louisiana IceGators of the SPHL to the Wheeling Nailers of the ECHL to the Milwaukee Admirals of the AHL. If you were going to send Darling a letter, it was best to double check his mailing address. Darling still has those duffel bags and the TV, but they now rest in a house he owns in Chicago. He established stability in his adult life for the first time by earning a roster spot with the Chicago Blackhawks and signing a multi-year contract. “That was the most fun part when I bought my house,” said Darling, who is from Lemont, Ill. “I didn’t have anything to put in it. … Luckily my girlfriend had enough for both of us. That filled up the house pretty good. Life became complicated for Darling at college. He was coming along fine after playing Junior hockey in the NAHL in Iowa, EJHL in Connecticut and USHL in Indiana. Alcohol entered his life in college and overtook him. It led to him being kicked off the University of Maine’s team as a sophomore. He awoke one day while playing in Louisiana a season later realizing he had to make changes or else. Darling took control of his life by eliminating alcohol and focusing on hockey. In the summer of 2011, he turned to his longtime goalie coach Brian Daccord, who helped Darling get back on the right track. Eventually, Blackhawks general manager Stan Bowman saw potential in Darling and offered him a one-year contract. 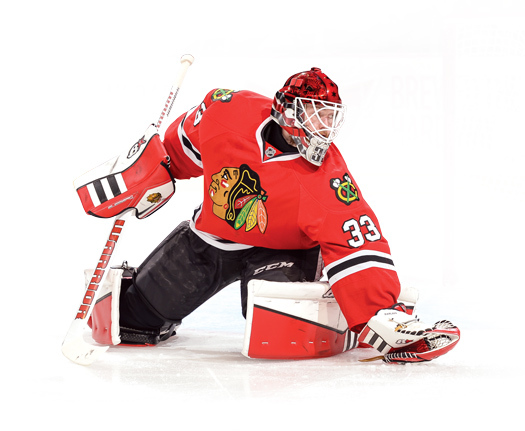 Darling earned his first NHL call-up in October 2014. Bowman committed to him as the team’s No. 2 goalie in February and signed him to a two-year extension. Darling later helped the Blackhawks to the Stanley Cup with three victories against the Nashville Predators in the first round. Daccord is grateful Darling, who is now 27, made the necessary changes when he did. Darling remains sober to this day, but it’s not something he has to battle to do. He said he never struggled with it throughout the team’s numerous Stanley Cup celebrations. As trying as it was to get to the NHL, Darling doesn’t regret the path he took to get there. Experiences like living in a log cabin while broke in West Virginia are what made him who he is today. “I look back on it all fondly, especially now that everything is good, the ship has been righted,” Darling said. Scott Powers is a freelance writer based in Chicago. Moving is hard for any youngster, but Christian was fortunate to have hockey to make his transition easier when his father’s work forced the family to relocate from Toronto to eastern Pennsylvania. As his mother, Tina, said, “Hockey brings everyone together. His parents are proud to see how well Christian has handled the move and made great friends in the Central Bucks School District and on the ice as a defenseman with the Philadelphia Revolution Squirt team. “The best part is watching him and his teammates as they chat on the ice, plan and set up a play and fist pump one another when something goes their way,” mom said. In addition to playing hockey, Christian loves snowboarding, reading and playing the trumpet.